Add the GoldVisionPro icon to the Paperport Menu. Or setup ScanDirect for scanning directly to GoldVisionPro Software. Paperport converts files to PDF and simultaneously creates Links in GoldVisionPro for later access. The Paperport Desktop is a handy tool which users can stack and preview scans prior to Linking them. Users can route faxes from most popular desktop faxing systems and link them using GoldVisionPro into the proper record designation. Users can Drag and Drop from the Link Center to a fax driver sitting on the desktop and Launch the faxing software with ease. With Microsoft Office Document Imaging, you can use a scanned document as easily as other Microsoft Office documents on your computer. Microsoft Office Document Imaging actually has two components - a scanning component and an imaging component. 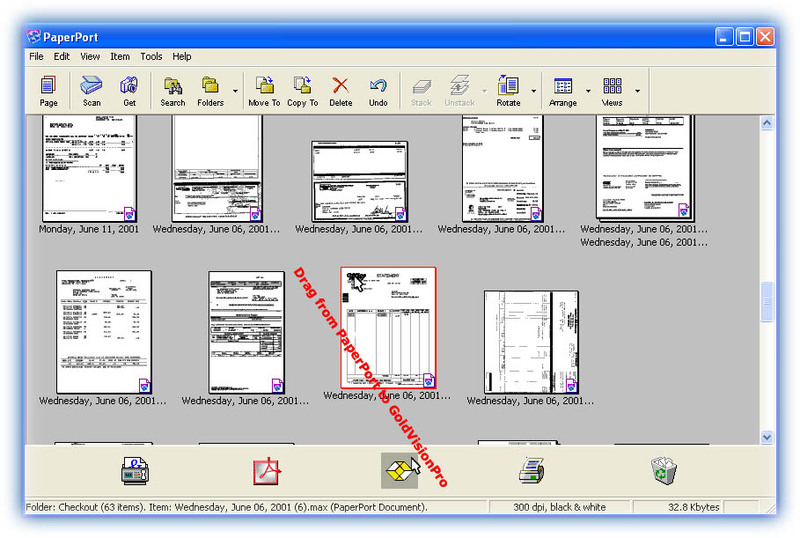 The first component controls the scanning of documents into your computer by using any installed scanner. This is done by using scanning presets, which control your scanner by using settings that are optimized for specific purposes. For example, the Black and white scanning preset is ideal when scanning pages of text for OCR, while the Color scanning preset is best for scanning full-color pictures or artwork. Also, OCR is automatically performed by default on text documents immediately after scanning, and you can easily scan multiple pages into a single file. For a demonstration, please email: sales@goldvisionsoftware.com and request the on-line "Scanning" demonstration.